Growl is a popular notification system for Mac OS X that throws up those fading pop-up windows in the upper right corner of the screen. 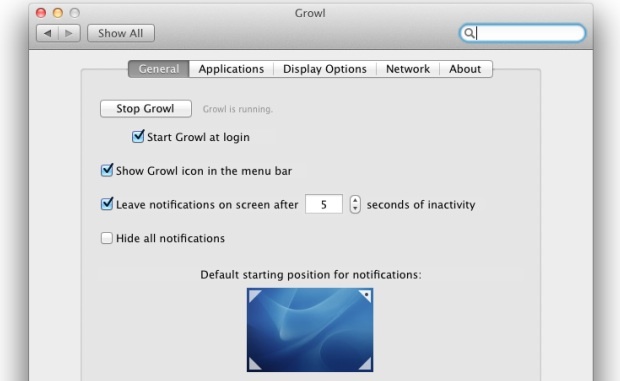 It’s a nice add on to OS X, and tons of other applications use Growl as their notification system. Then Mac OS X 10.7 came out, and Growl went from being open source to closed, and now it costs $2 to get the newest features in addition to Lion compatibility. Right? Wrong. Growl Fork, as the name implies, is a fork of Growl from the last open sourced version, and best of all, it includes Mac OS X Lion compatibility. If you don’t need the newer features in the official version and just want compatibility with Lion and your apps to continue receiving notifications, Growl Fork works just fine. Install Growl Fork and it’ll appear in your System Preferences as usual, ready for configuration and with all of the settings that you had before in Snow Leopard. Again, it doesn’t have the newest features from the newest App Store version, but it works great and is completely free. If you have the tools, you can also compile it and install Growl 1.3.x yourself (I did!) without having to pay anyone. In theory, instead of using the retrofitted Growl 1.2.x code linked above, someone could just download a copy of the Growl 1.3 sources, compile them, and make it available to whoever they wanted to get the latest features…all of which is permitted by the BSD license. Of course, doing so would not be supporting the developers who are working on Growl, but that’s a different question. Good to know, thanks for this! Yes, this. All you need to do is download and install XCode, use git, and build it yourself. I understand this is beyond the scope of most computer users capabilities, but it’s really not too difficult. HardwareGrowler 1.3.x still open source too. and you can update source code 1.3 to 1.3.2 now. cd is cd your Growl source path. Righto, I was just about to post that link. Ultimately I think the Fork is for the average joe who doesn’t know how to compile things, but who also doesn’t want to pay for the convenience of a preinstalled package. The guy that forked Growl did it because, at the time, there were some pretty serious bugs with the existing Growl on Lion, and the source code for the released $2 app was not available… so the guy paid $2 for something that didn’t work for him… he and the Growl developers got in to a war (you can debate who to blame) and the Growl devs banned him from their mailing list… so he forked it and fixed the bug, then made his version available. You can google for the details if you care. The source code is available now… so this fork will probably have a limited lifespan. It’s really not that expensive guys. A good utility worth paying a bit for, especially given it’s not actually closed source. The problem with Growl 1.3 is not such much that it’s a paid app, but that the API changed and “old” applications (like Colloquy) don’t work with it. This, iirc, was the reason for the fork. I was happy to pay a meer $2.00 to support, however slightly, the developers of Growl. I’m glad there is still a free version too, but $2.00 isn’t really much to ask. Almost bought the new one on the app store but found out it was pointless because it changed developer api breaking support with all apps save a handful. Kind of pointless to buy a useless product. If the development team was clever enough to support the old api along with the new api I would have most definitely purchased it. Since the new growl api supports notifications without installing growl, why update? The concept of paying $2 to break stuff for a program that will just go away when Apple puts out their own hopefully improved version of notifications in Mountain Lion is silly. They are just trying to make sure they are ready for becoming obsolete, and that they can get a little money before they go away. Thanks so much for creating the fork! Now superduper, gaim, other applications are working again. Let’s keep open source open!